I have chosen the Crow Moon to celebrate the full moon of the 23rd because I am surrounded by the flappy black blighters. Lots of people hate them – frightening off the songbirds from the bird tables as they craftily work out how to burgle your squirrel-proof feeder. They are absolutely the noisiest neighbours in the history of Christendom. Many years ago, we were in a BBC Scotland gardening programme called The Beechgrove Garden. When the producer turned up to ask me some preliminary questions, he was astounded by the amount of noise that the crows were making. I was surprised- after half a dozen years, they failed to even register with me as being vocal! Now nearly 20 years later, I adore my great dark neighbours. They’re clever, cruel and vastly entertaining to watch. I’ve hand-reared fallen chicks – wary-eyed feather dusters – with, erm, let’s say, VARYING degrees of success. I’ve rescued one who dangled by a claw from a bird feeder. I love their rhythms – wheeling noisily into the sky at dawn and then at dusk dropping into the treetops and settling in waves, like a black tide. At this time of year they toil through the skies clutching enormous twigs (usually the spring clippings from some garden border!) often so large that if one plummets from a distracted beak, you can get quite a startle as it clatters onto the pavement! The Crow Moon is, for me, a time when Spring arrives proper. The ground is warming up, the sap is rising, the worms are working madly beneath the ground, pushing up their casts onto lawns all over the land. 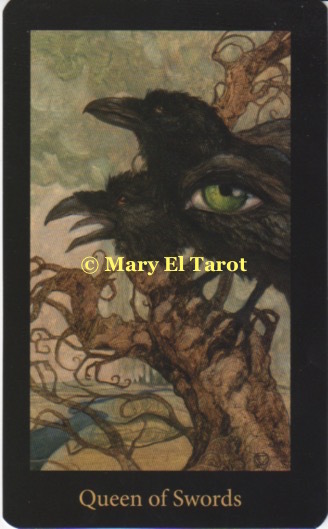 I choose The Queen of Swords from the Mary El to illustrate the Crow Moon. What is pulsing into life? The creative intellect of the Queen of Swords is what! As the year gathers power, so does our Swords energy – communication, brain stuff, book-learning, natural intelligence …. coupled with the Queen’s spirit – protective, nurturing and creative. Got a creative project lurking inside you? The Queen is telling you to Get. On. With. it. Thank you for sharing your thoughts here. I love crows – they are actually some of the most intelligent animals out there, so it's no wonder we humans have found so much significance in them.